Jeep refreshed the Grand Cherokee’s styling in 2013, improved the interior and unveiled an eight-speed automatic gearbox. Think of it as the advance landing party for a new range, which includes the smaller Cherokee and Renegade. Here we are testing the high-spec Overland with a powerful 3.0-litre V6 diesel. But what are we looking for? A facelift is all well and good, but the Jeep faces more recent redesigns such as the Volvo XC90’s. Can it rival more up-to-date vehicles? And what tow car ability does the Jeep Grand Cherokee have? Read on for our expert's review. A good tow car needs more than heft and a powerful engine, but they certainly help. The Jeep Grand Cherokee has both. Its huge 2328kg kerbweight gives an 85% match figure of 1979kg. That’s high enough to make the Jeep a sensible match for just about any caravan, even a luxury twin-axle. The towing limit is a stratospheric 3500kg and the towball limit is 140kg. The Jeep’s muscle comes from a 3.0-litre V6 diesel producing 247bhp and 420lb ft of torque. We hitched it to a Bailey Unicorn Cordoba with a mass in running order of 1590kg, and the Jeep was able to pull it from 30-60mph in just 8.7 seconds. That’s serious pace, and means drivers can overtake with confidence. The big Jeep stops as well as it goes. It took 10m to bring car and caravan to a halt from 30mph. At the legal limit, the Jeep felt settled and in control. When the wind picked up, the driver had to steer to keep the Jeep towing straight, but only a little bit. However, it didn’t perform as well in our lane-change test, in which it was shoved by the caravan. The Grand Cherokee has a foot-operated parking brake rather than an electronic one, as found on most rivals. On a steep slope, the pedal must be pushed down firmly to keep the car and caravan from creeping backwards. The driver’s first instinct when this happens is to push on the pedal again, but this releases the brake. Other than that, the Jeep has no trouble with hill starts. Aside from the parking brake and its showing in the lane-change test, the Grand Cherokee is a very capable tow car. The Jeep is a big car – and feels like one. The numb, slow steering contributes to a cumbersome drive on twisting country roads. 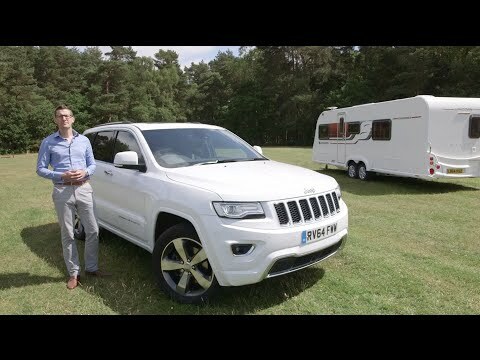 The Grand Cherokee is more at home on A-roads and motorways. Air suspension is standard on the high-spec Overland model and delivers a comfortable ride at speed, although it’s a bit lumpy around town and over poor surfaces. It will also go further off-road than most rivals. The Selec-Terrain system allows the driver to fine-tune traction control at the twist of a dial to suit the surface. A low-ratio button gives lower gears for serious off-roading – or pulling a tourer from a really muddy pitch. Such is the torque from the 3.0-litre engine that you’ll have to be in a real quagmire before that button is needed. Without a van to pull, the Jeep is quick and, while the V6 diesel isn’t the quietest engine, its deep rumble is characterful rather than annoying. Jeep made big strides with the interior of the Grand Cherokee as part of the 2013 facelift. The standard of finish has improved greatly, and the design is attractive and up-to-date. However, high-quality materials and a clever touch-screen infotainment system can’t disguise the small cabin. Those in the front have plenty of space, but legroom in the back is modest for such a big car. We found the optional DVD/Blu-Ray system stole more knee room. Jeep measures the boot’s capacity from the ceiling rather than under the parcel shelf, so the quoted 782 litres isn’t all that generous. The gap between the boot floor and the luggage cover is very shallow, and the floor sits a long way off the ground. Our Overland test car costs £48,195. That’s a lot when our favourite big 4x4, the Land Rover Discovery in SE Tech trim, costs £47,500. Take account of the Jeep’s standard equipment, though, and it appears much better value. A rear-view camera, parking sensors, 20in alloys, a panoramic sunroof, Nappa leather trim, heated seats in both rows, an 8.4in touchscreen sat-nav and infotainment system, a nine-speaker stereo and a long list of safety kit are just highlights. The Jeep returns 37.7mpg on the combined cycle; we recorded 24.8mpg on tow. The new Volvo XC90 and other rivals promise better economy and lower CO2 emissions. The 2013 facelift improved the Jeep Grand Cherokee enormously, but there’s no doubt that you can buy roomier and more fuel-efficient rivals for similar money. As a tow car, though, the big Jeep still gives a good account of itself. What’s more, it possesses a rugged charm that’s hard to ignore.